PTS has partnered with KWA to produce a professional grade training rifle, featuring a plethora of interesting features and covered in Magpul PTS goodies. The fruit of their labors is called the RM4 ERG, and this specific model is the "Scout" variant. The list of "training friendly" features include recoil (not EBB, real palpable recoil), a specialized magazine system that feeds every round, and an electronic cutoff feature that stops the gun from firing when you run out of ammo. It's a cool looking gun with even cooler tricks up its sleeve, so keep reading for more info on this AEG! 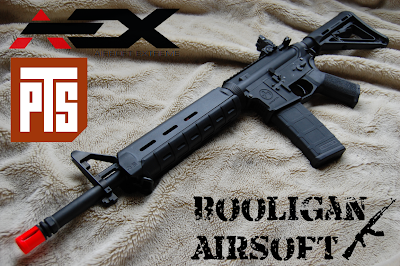 I was sent this gun through Airsoft Extreme, who has it available HERE, currently priced at $379.95. It was shipped out quickly and arrived a few days later using UPS Ground. Many thanks to AEX for their continued support of Airsoft Retreat and Booligan Airsoft's review programs! As mentioned before, the RM4 is a specialized AEG design centered around KWA's new ERG (Electric Recoil Gun) platform. Fitted with a Magul metal body, and all MOE furniture, it's a Magpul lover's dream gun. Even though it uses a funky new gearbox design, it retains the ability to use standard TM compatible magazines, albeit with the loss of some of the training functionality. This "Scout" type carbine features a replicated midlength gas system and the appropriate MOE midlength handguard to go along with it. My favorite feature of the gun is the recoil that it offers, which I'll talk about more in the performance section of this review. Like most PTS guns, the RM4 comes in a brown cardboard box with orange and black graphics and an integrated plastic carrying handle. The gun is held in a styrofoam inner liner with cutouts to hold the included accessories. Everything stayed right where it was supposed do during shipping and the gun arrived free from damage. When I opened the box, my eyes were immediately drawn to the beautiful Magpul body, and when I pulled it out of the box, I was very pleased with the feel and weight balance. Along with the rifle itself, you'll find a manual, warranty card, loading tube/rod, cleaning/unjamming rod, magazine cover, and barrel cap. There is no battery or charger included, so you will need to supply your own. I will be using a Tenergy 11.1v 20C 1000 mAh in my testing. Length of Pull: 10.5" – 13.75"
The RM4 is a great visual replica of the multitude of real Magpul equipped ARs that you see at nearly every gun store or show. It is a full metal replica, in that the only polymer parts are shared with the real gun. The body is finished in a deep matte black coloring, and the polymer furniture matches it very nicely. The paint finish on the receiver is susceptible to scratching, especially from the bolt catch when you disassemble it. The stock is a standard Magpul PTS MOE unit, fitted on a 6 position metal buffer tube. The buffer tube is a special design that houses the recoil assembly. Removing the buffer tube removes the metal spring guide, allowing you to swap out the spring with relative ease. At the base of the buffer tube, you will find an ambidextrous sling mount, so slinging this beast will be a simple affair. Moving forward from the stock, you will notice the Magpul designed lower receiver with integrated trigger guard. It is made of metal and has deeply molded Magpul trademarks, adding to the overall look of the gun. The upper receiver is a pretty standard M4 upper, nothing too crazy here. The gun does have a locking faux bolt carrier, so when you pull back the charging handle, the bolt locks back, allowing easy adjustment of the hop-up. The bolt itself does not blow back or move at all during firing. Mine started getting caught after I disassembled the gun to the gearbox. It appears that this is something that can happen with this gun due to the thin metal used on the bolt assembly. The solution for it is just to bend the bolt slightly, especially where the spring sits until it operates smoothly. It's a trial and error process, due to the tight tolerances of the gun, but it can be fixed relatively easily. The pistol grip is a Magpul MOE unit and fits my hand VERY well. I've always been a fan of MOE and MIAD grips, and this is no exception. It has a large flat head adjustment screw for easy motor height adjustment. The controls are pretty standard, with a left sided selector switch, right sided magazine release, and left sided bolt catch which functions both as a way to release the faux bolt carrier and to reset the gun after swapping in a fresh magazine. Moving forward from the receiver, you'll notice the midlength Magpul MOE handguard. The handguard is very comfortable to hold and there are several options out there to add rail panels if you want to mount accessories on it. It acts as your battery compartment, given that the gun is front wired, and as such, your battery options are a little limited. The gun does have a faux gas tube, so you can't install a battery at the top of the handguard, only the lower half. The outer barrel is a full metal 14.5" long unit with a non tapered profile, unlike a standard M4 outer barrel which has M203 mounting cuts. It's a damn solid barrel and is terminated in a 14mm- threaded muzzle. The orange tip is painted onto the metal birdcage type flashhider. The front iron sight is a standard M4 triangle front unit which is adjustable for elevation. The rear sight is a Magpul Gen 2 MBUS which is adjustable for windage. When locked down, it is pretty low profile allowing for the use of a red dot sight to cowitness with the front sight. It easily pops up when you push the ambidextrous release nubs or the top cover. There are dual apertures for various ranges. The whole upper receiver has a 20mm top rail, so optics are very easy to mount on the RM4. PTS used their Magpul connection to full effect with this gun, as it features legally licensed Magpul PTS parts throughout the gun. The receiver, stock, handguard, grip, magazine, and rear sight are all properly licensed and have the appropriate markings. The included magazine is a specialized design that facilitates many of the most realistic features of this gun. The profile is much similar to a real AR magazine compared to a standard AEG magazine. It is a PMag design, midcap type, with an interchangeable 30 or 60 round capacity, accessed by flipping a little switch inside the magazine body. The magazine has an extended flexible follower which allows it to feed every round in the magazine. No more dropped BBs with you change mags! When the included magazine runs out of BBs, the gun will stop firing until you change the mag, followed by hitting the bolt release button on the left side of the receiver. Spare mags are available and aren't too pricey! Despite this special magazine design, the gun still has the ability to use pretty much all standard AR platform AEG magazines. The only thing is that it will lose the ability to feed every round, due to the lack of an extended follower on most mags, and the gun will not stop firing when empty. FPS consistency was quite good, giving me a very small spread from slowest to fastest shot. This surprised me, as the air seal wasn't very good, as I'll explain in the internal section. Rate of fire will obviously vary depending on the battery that you use, but with the Tenergy 11.1v 20C 1000 mAh LiPo I used, I got 15 RPS tested using Audacity. It's not the fastest ROF, but you would be surprised with how fast it feels with the gun kicking a bit into your shoulder with every shot. Range and accuracy were what I expected from a 2G bucking equipped gun shooting at this velocity. On semi auto on a torso sized target, I could easily hit out to 165' using .25g Airsoft Elite ammo. Surprisingly, the recoil does affect your accuracy when firing in full auto, especially when firing from an unsupported position. The recoil is hard to describe. I had previously seen a reviewer describe it at like a cell phone on vibrate mode, and that was not my experience at all. You can really feel the weight in the buffer tube reciprocate with every shot. It's enough that you feel it shake the whole gun, especially when you're firing on full auto. I'd put it on par with most gas blowback rifles I've shot, but certainly not at the same force as a real AR. It feels pretty similar to a 10/22 in the way that it shoots. Accessing the gearbox is a relatively simple affair, following most of the traditional M4 disassembly procedures. The big difference is that you will first need to remove the buffer tube by unscrewing the locking ring, unscrewing and pulling back the sling mount, and unscrewing the buffer tube assembly itself. Doing this will remove the quick change spring system, as well as the entire recoil assembly in one piece. Other than that, you just need to remove the pistol grip, motor, and receiver pin to get the gearbox out. Thankfully, the magazine release does not need to be removed. Before opening the gearbox, you'll notice the large ball bearings, which appear to be 8mm in diameter. You'll also notice that the gearbox shell itself is a funky design with plenty of reinforcement at the front to prevent it from cracking. The selector plate is proprietary, as are many of the external levers and other doohickeys. Luckily, it's manufactured by KWA, so spare parts will be readily available through the Proshop. Inside the gearbox, you'll find steel gears with a sector chip installed, a standard piston with a metal last tooth, metal unported piston head, ported cylinder, and polymer cylinder head. The tappet plate and air nozzle appear to be proprietary. Strangely, the gun has a very poor air seal, however, the firing consistency is great. It's kind of a strange anomaly, and I'd be interested in seeing what improving the air seal would do to the performance. Also, there were no shims installed at all, but everything meshed together pretty well. The gun has an inline rotary adjustable hop-up unit which is made of a polymer material. The gun has a split 2G bucking which gave me great accuracy and consistency. The inner barrel is listed as being 6.05mm ID and it is 395mm long, which is a strange length for a 14.5" outer barrel equipped gun. The RM4 has a standard long length motor, so upgrades are very simple. It is marked as a KWA High Torque unit, but it doesn't give too much resistance when you spin it by hand. External modifications are a piece of cake with this gun, as it pretty much uses standard M4 externals. The only thing really hindering your ability to mod it externally is the need to have it front wired, due to the recoil system occupying the buffer tube. Adding a RIS will likely require you to use an external battery box. Internal mods will depend on what exactly you want to do with it. It uses many standard V2 type gearbox components, and everything seems like it'll take the forces of upgraded springs, etc. Recoil that actually feels great! Having used many EBB guns with purported "recoil", I wasn't sure what I was expecting with this gun. First thing I did when I pulled the gun out of the box was to throw a battery in it and see how it feels when shooting. I'm really happy to report that this gun doesn't deliver some chintzy vibration like a cell phone on silent mode. You really can feel the weight in the recoil assembly thunk back and forth with every shot, especially on full auto mode. Every person, man, woman, or child, that I've had test out this gun has just automatically started grinning ear to ear when they fire it. But this recoil feeling is just one of several cool features that this platform offers. The magazine works extremely well, both with the extended follower that feeds every BB, as well as the tab that cuts off the gearbox when empty. As a training platform, this thing really does rival Gas Blowback rifles, and offers firing consistency and the ability to function in any weather conditions that GBBRs can't yet match. The fact that it's basically a solid training rifle out of the box, at under $400, less than half the price of a Systema and cheaper than a fully built GBBR is pretty astounding. Thanks for the review ! I want to buy this gun, but I'm afraid of the internal (it may break ?!) ? Any gun can break. Airsoft guns aren't perfect and stuff can happen. If you check his follow-up video, he showed a fix for the issue he had. Mine has had several thousand rounds through it so far and it's functioned flawlessly. Another question, do you know if there is a CQB version of this gun available ? Or will it be release after ? Yes, a CQB version is coming soon. Would it be possible to fit a Chimera or ASCU in the gearbox? ASCU requires it to be rear wired last time I checked, so that's out. For the Chimera, I'm not sure, but I doubt it. The gearbox shell in the trigger area has a different shape, and I don't know if everything will cooperate with the empty magazine cutoff, etc. I have this gun. It is pretty awesome with its cutoff and recoil systems. I suggest this whoever is thinking to buy a GBBR. I have also a question. Unfortunately I bent the inner barrel and had to replace it with 6.04 mm one. But I forgot to put the little spring which is supposed to be on inner barrel just near the hopup unit and behind the delta ring. So is this a problem? Should I disassemble the gun to make that spring on its place? also I replaced the actual spring with a madbul m140 nonlinear spring. Is this is good choice? On the subject of computer mosfets in the rm4, is it any more difficult in general to reassemble(gearbox) than a typical V2 and if you get the chance could you post a picture of the gearbox shell without the trigger unit in to show the shape. I don't have the gun anymore, it had to go back to PTS right after my review, so the gearbox pics I have are the only ones I can provide. Ok, I understand. I'm going to get the rm4 and I'll check the fitment of my ascu I have laying around from a gun that needs repair. Ah, the V2 gearbox crack always hurts. When you reload this weapon, is it possible to pull the charging handle instead of hitting the bolt-catch ? (is the charging handle functional, and allows the gun to fire again ?). I don't believe so. The system appears to be connected directly to the bolt catch. Yes. You can charge with the bolt release paddle or by using the charging handle. Both are correct in the manual of arms for the real firearm and are available on the RM4. Curiously, when releasing the bolt catch, you dry fire on the first shot after the bolt release, then it's rock and roll. Don't know why.